Our Annual Winter Course kicks off tomorrow, February 3 at Keystone Resort. Stay tuned for photos and a recap of the training coming soon. In the meantime, here’s a really cool update about another type of winter training. Last week, C-RAD teams performed an avalanche rescue drill with the High Altitude Aviation Training Station (HAATS), which is run by the National Guard in Gypsum, Colorado. We collaborate on drills like this to prepare for large avalanches with multiple burials. 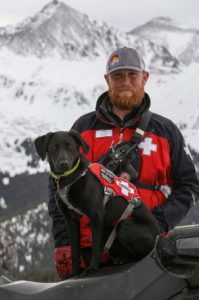 Dog teams from Beaver Creek and Vail exchanged via Black Hawk Helicopter, where multiple burial scenarios were waiting for them, including live burials, multiple avalanche beacons and Reccos. A HAATS Black Hawk helicopter can transport five rescue personnel, plus two to three avalanche dogs to a scene. Additionally, a Black Hawk is better equipped to fly in adverse weather and to precarious locations than Flight For Life helicopters that are used for standard rescue missions. Kudos to our Beaver Creek and Vail Mountain dog teams, plus HAATS for a successful drill! Special thanks to Drew Warkentin and Sam Bryson for sharing their photos with us.